A panoramic view of the Windhover Contemplative Center The newly opened Windhover Contemplative Center, a 4,000 square foot rammed-earth and wood structure which occupies the former site of a parking lot, wouldn't exist without a deeply held conviction of the late Nathan Oliveira (1928-2010): that quiet contemplation feeds and fuels the imagination. 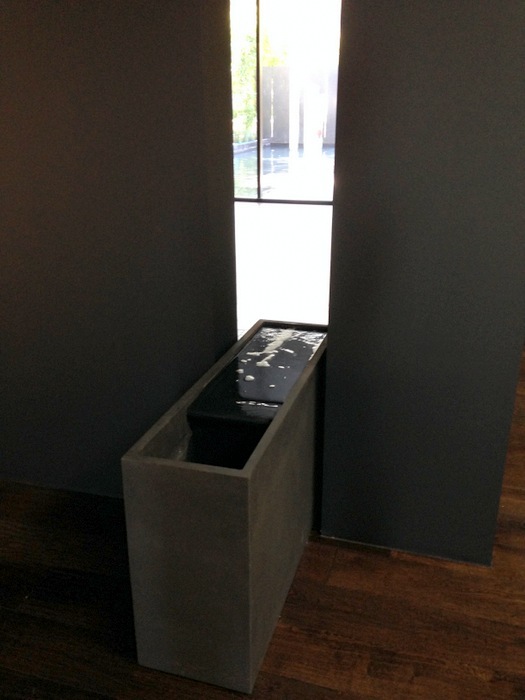 Years of working in the silence of his own studio and also the solace he found during long walks in the peaceful Stanford hills -- where he delighted in watching soaring birds -- convinced Oliveira that each of us has an inner imaginative world that blossoms through observation and meditation. "If you persist and you believe in it your world opens up to you," Oliveira once stated. "Sometimes that takes an entire lifetime." Beginning in the 1970s Oliveira worked on images of birds and flight that culminated in the paintings now permanently on display at the center. These images, in turn, led to the idea for the Windhover, which will extend the artist's uplifting vision into the future. Oliveira's Windhover paintings take their name from a poem by Gerard Manley Hopkins (1844-1889), that uses the flight of a falcon as a metaphor for spiritual striving and realization. A portion of the poem is etched into reflective glass visible near the building's entrance. The imagery of the four Oliveira paintings on view at the Windhover includes wings, catenary curves and a kestrel, all presented on semi-abstract grounds. Designed by Aidlin Darling Design, the glass-enclosed center shows the influence of Japanese architecture. As they approach the building, visitors will pass through a long stand of bamboo that delineates a kind of barrier between the outside world and the center's meditative space. 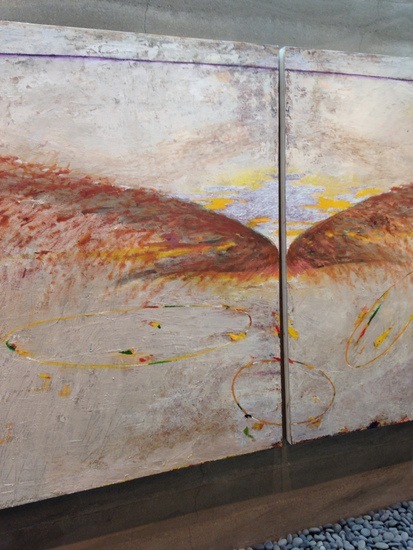 In the building's interior are three rooms that feature four Oliveira paintings -- Big Red, Diptych, White Wing and Sun Radiating -- all of which are visible from both inside and outside the building. Skylights and motorized louver drapes provide carefully modulated natural light. 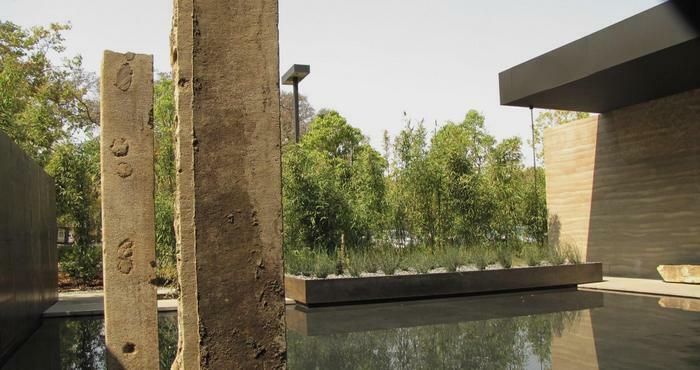 The thick rammed-earth walls, made from soil excavated directly from the site, help moderate heat and sound. The Reflection Pool A reflection pool near the building's entrance features two concrete monoliths that are in fact pieces of architectural debris from the university's boneyard. The sound of running water, which flows into a rectangular fountain, helps dampen outside noises. A pebble-floored Zen garden rimmed by benches appears at the building's opposite end, sheltering a single tree and another small fountain. An Interior Fountain Stanford's Office of Religious Life is overseeing the Windhover, which will provide a quiet alternative to Stanford's relatively busy Memorial Church, which hosts services, weddings and concerts. The center fits in well with two of Stanford's current initiatives -- the Wellness Initiative and the Arts Initiative -- and compliments the display of three Oliveira paintings in the new Anderson Collection at Stanford. The Windhover Contemplative Center joins Houston's Rothko Chapel and James Turrell's "Twilight Epihany" at Rice University as one of a slowly growing number of American structures that meld contemplative practice with the visions of modern and contemporary artists. The Reflecting Pond In a 2009 speech in Vancouver, the Dalai Lama offered his opinion that "The world will be saved by Western Women." 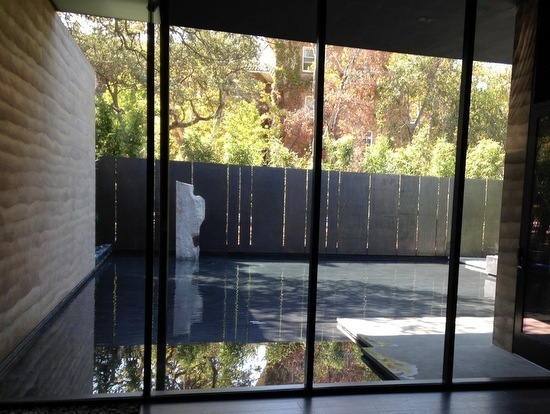 During my visit to the Windhover Contemplative Center a group of Stanford women chatted on the benches of the Zen garden and shared their sense of excitement about the new center. I couldn't help envisioning these young women growing into adulthood, their imaginations sheltered and nourished by the Windhover, to fulfill the Dalai Lama's prediction. Beautiful place to go, that encourages mindfulness. We need more spaces like this; I recall a few over the years that offered an immersion for contemplation. Years ago, I overheard a minister being interviewed in which he said something to the effect "it's not the building but the people, the congregation". This seems to me lopsided, and maybe this sort of attitude leads to the dearth of contemplative spaces.